This morning's record-breaking cold; the 24 degrees in Saranac Lake broke the prior record of 26 degrees, created a chance for me to witness a minor miracle and a life lesson in action. As you can see in today's photo, we had a heavy frost last night here at the homestead. 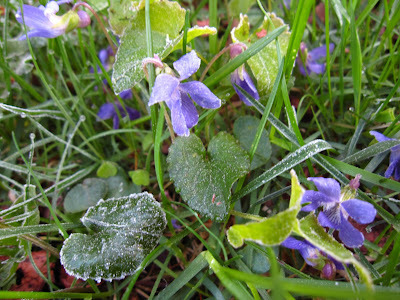 The pictured wood violets in my yard withstood the frost and look as stunning as ever. Perceived as such delicate, fragile flowers, they're the source of sayings such as, "a shrinking violet." Yet they force their way through piles of heavy leaves and twigs each Spring and maintain their beauty despite nearly being frozen to death. It goes to show you: appearances have nothing to do with strength. Yes, the alternate title for today's Adirondack Lifestyle blog post is "Lessons from the Adirondacks."